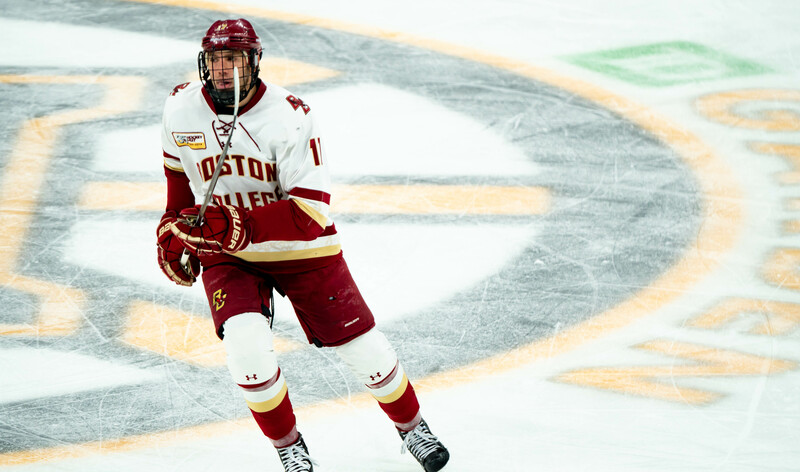 Late Comeback Comes Up Short for Eagles in Beanpot Championship | BANG. 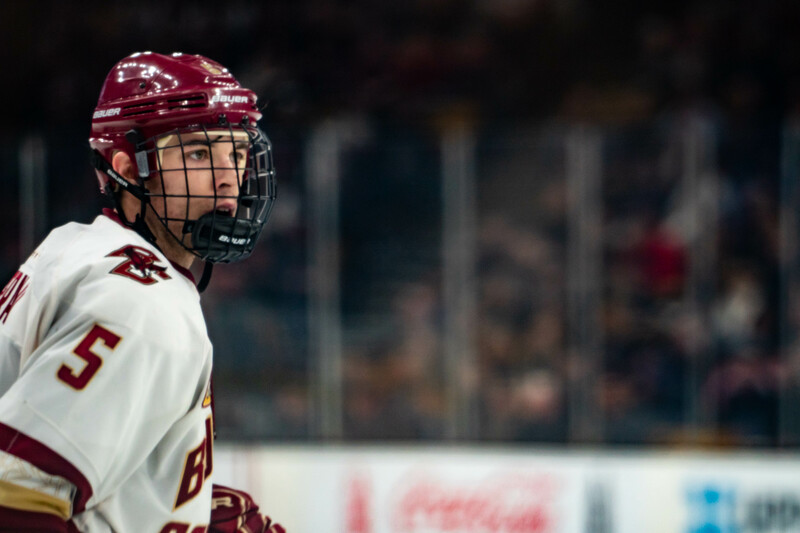 By many standards, BC men’s hockey played one of their best games of the season on Monday night in the Beanpot Championship. Unfortunately, it was not enough to topple Northeastern. 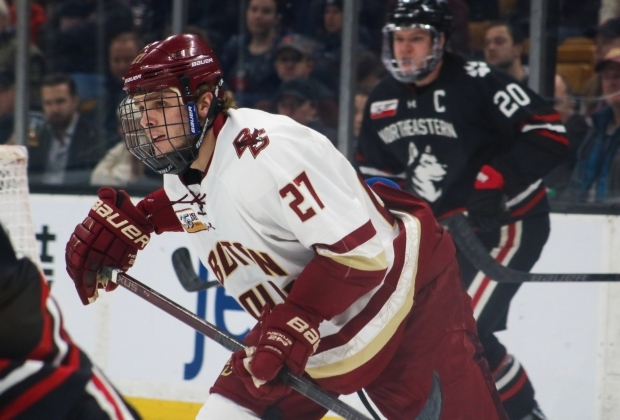 The Huskies skated to a 4-2 victory, marking their second consecutive Beanpot title. 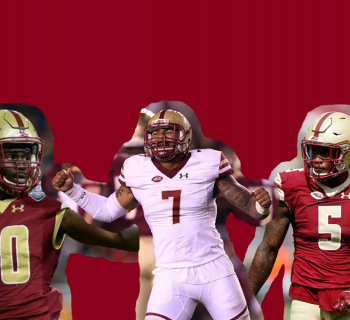 The game was a clean, fast-paced, and exciting matchup — there were only two penalties called throughout the entire contest. The two teams finished tied in shots on goal with 35 apice. Both goaltenders played invaluable roles for their respective teams between the pipes. The first period was an exciting one. The two teams were evenly matched, both seeing a number of scoring opportunities. 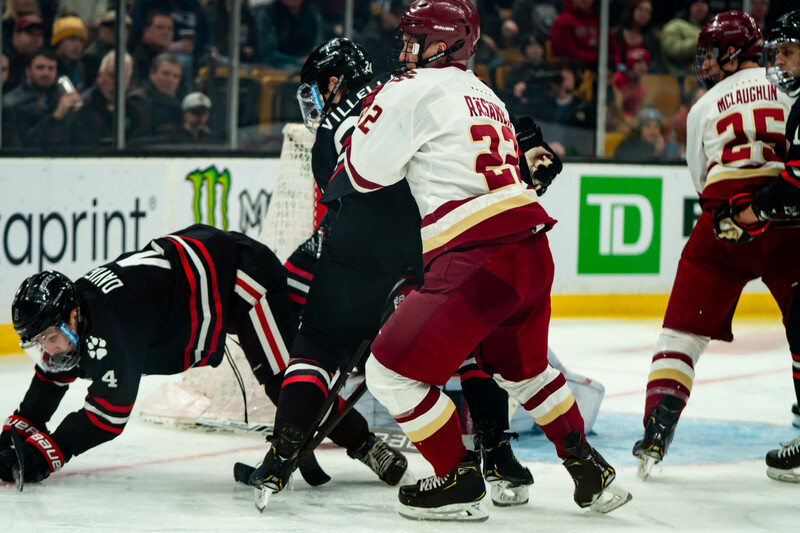 BC’s best chance came at the 13:45 mark, when the puck ended up in the back of the Northeastern net following a scrum in front of the goal. The referees called it a no-goal on the ice, saying that the net had been dislodged before the puck crossed the line. After a review of nearly seven minutes, the call on the ice was upheld. The game remained scoreless. 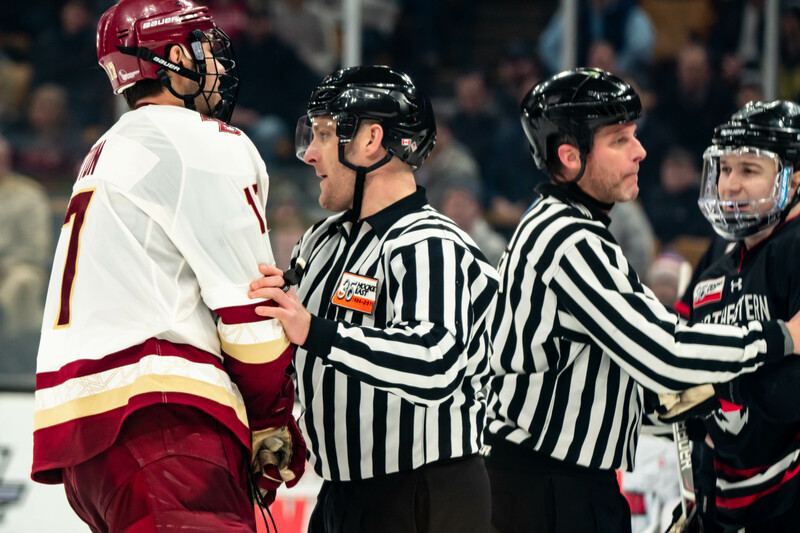 Following the game, BC Head Coach Jerry York mentioned that the officiating crew told him that the replay took so long because they had to rely on a call from officials upstairs in the booth, rather than looking at the video themselves. The call could have gone either way. 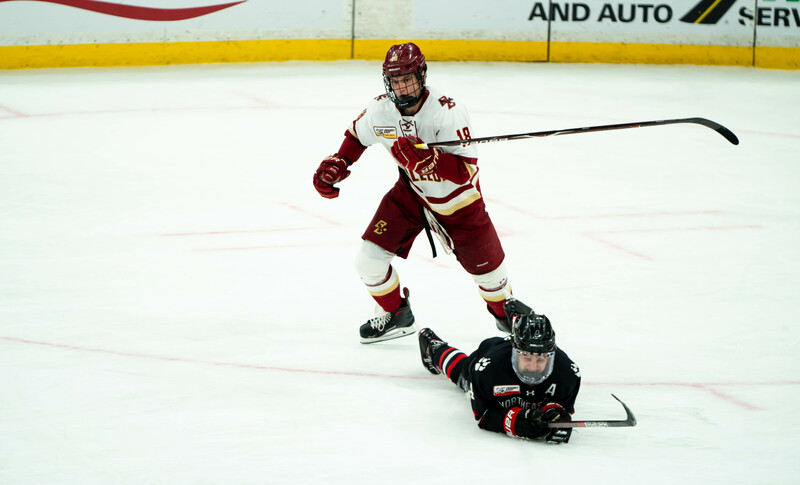 After the lengthy review, the controversial no-goal turned into a missed opportunity for the Eagles to grab some early momentum in what was to become a nail biter of a championship game. The two teams traded blows for the remainder of the first. Eagles goaltender Joseph Woll and Northeastern’s Cayden Primeau both came up with some acrobatic saves in net. 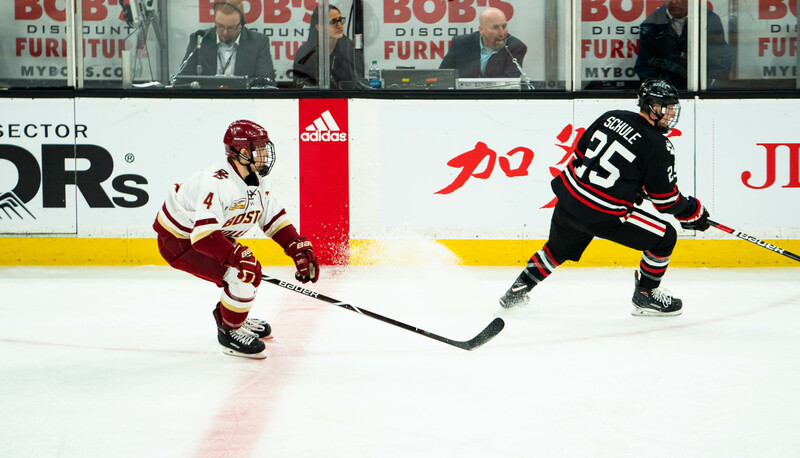 Neither side could find the back of the net until Northeastern’s Austin Plevy got the Huskies on the board with just 38 seconds left in the first. After Woll denied an initial wraparound chance, Plevy found himself in front of the net with the puck loose in the crease. 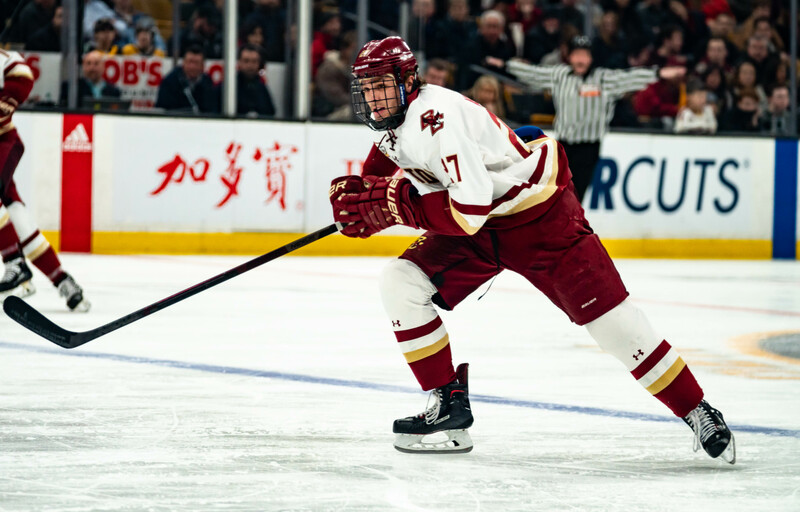 He was able to stuff one past an outstretched Woll to notch the first goal of the Beanpot Championship game. 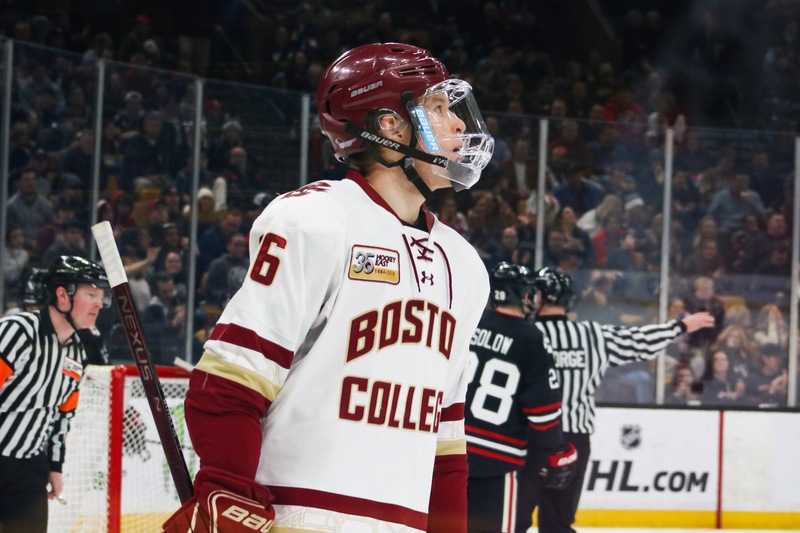 Early in the second, BC’s Oliver Wahlstrom was sent off for slashing. 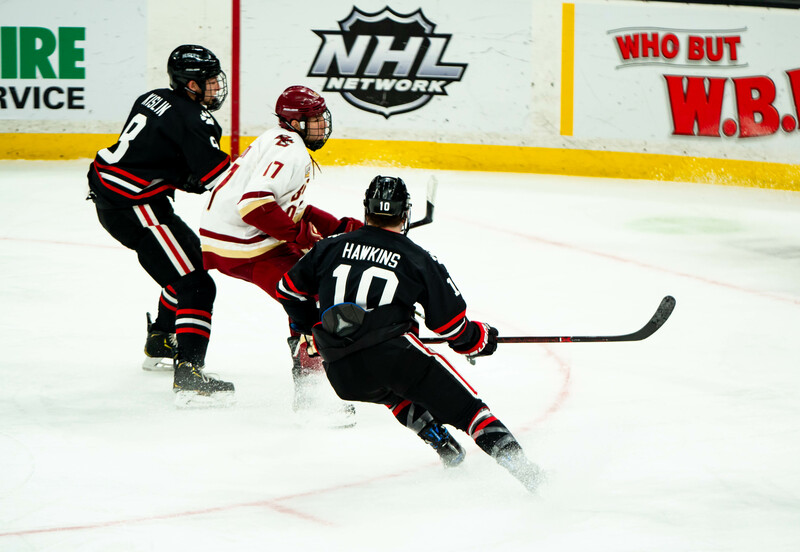 On the ensuing power play, the Huskies had a number of quality opportunities, but all were denied by Woll and the BC defense. 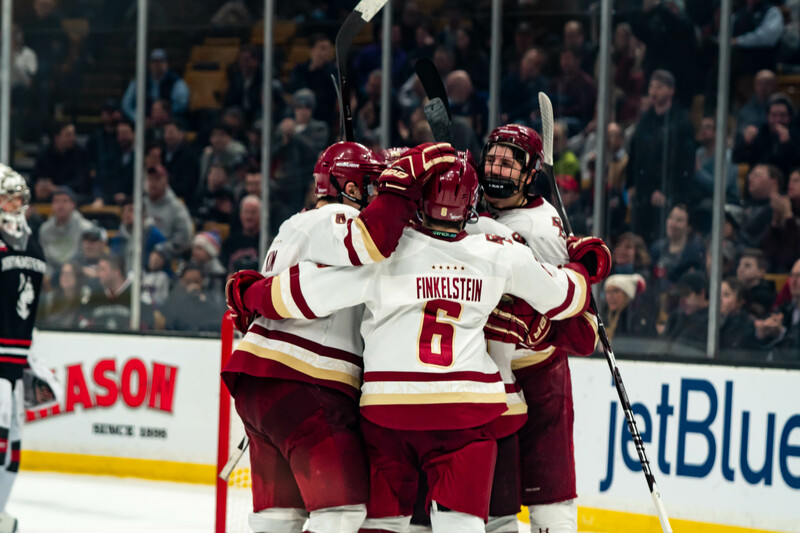 At 10:01 in the first, BC got their first power play opportunity of the night after a hooking call on Northeastern’s Jeremy Davies. Though the Eagles spent most of the two minutes in the offensive zone, they were unable to convert. 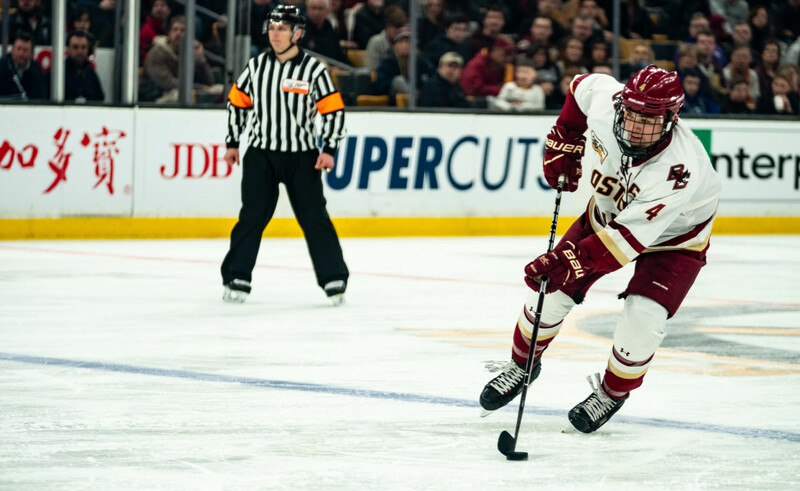 What the second period lacked in offense, it made up in physicality. A number of big hits got the crowd going on both sides. Players remained physical after the whistle as well, resulting in a couple of skirmishes in front of the nets. 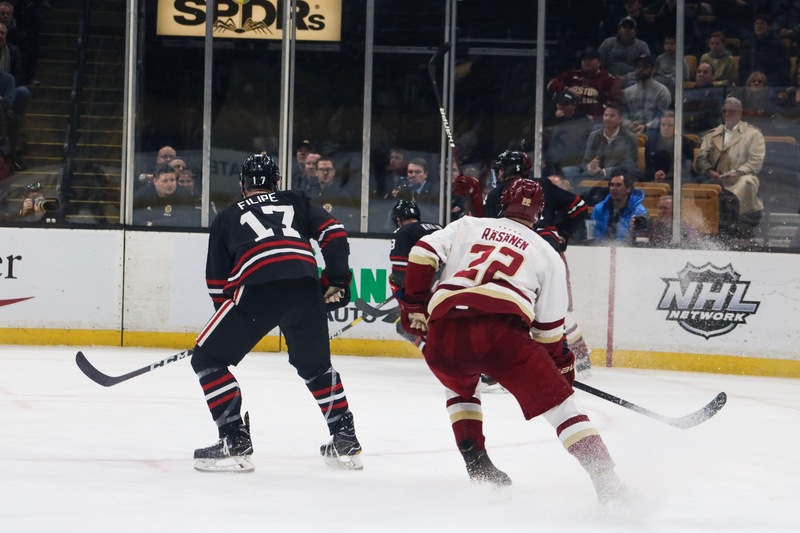 Though the Eagles spent much of the period in the offensive zone, it was Northeastern who would capitalize with another goal. The Huskies took advantage late in the period for the second frame in a row. NU forward Patrick Schule ripped a wrist shot over the shoulder of Joseph Woll to put Northeastern up by two at 17:54 in the second. 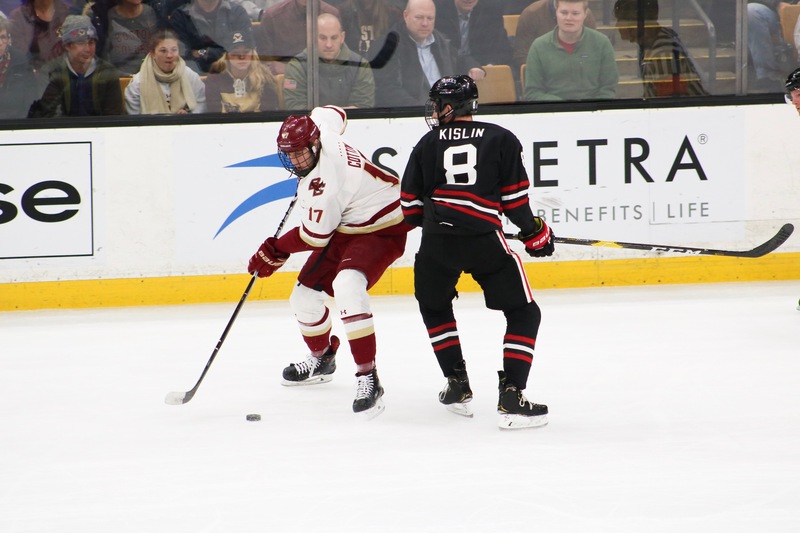 Despite the two-goal Northeastern lead, the Eagles had not been dominated through the first two periods. They led the face-off battle 27-15 through the first two frames. 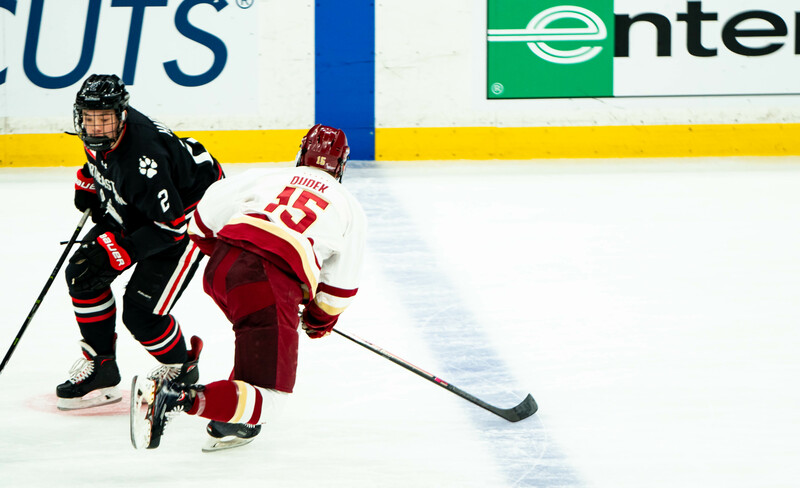 The Huskies held a slight advantage in shots on goal through two periods, 26-20. Both goalies played a huge role for their teams; Primeau and Woll both stayed sharp and made a number of highlight-worthy saves. “It was quite a display of goaltending, on both ends,” commented York after the game. 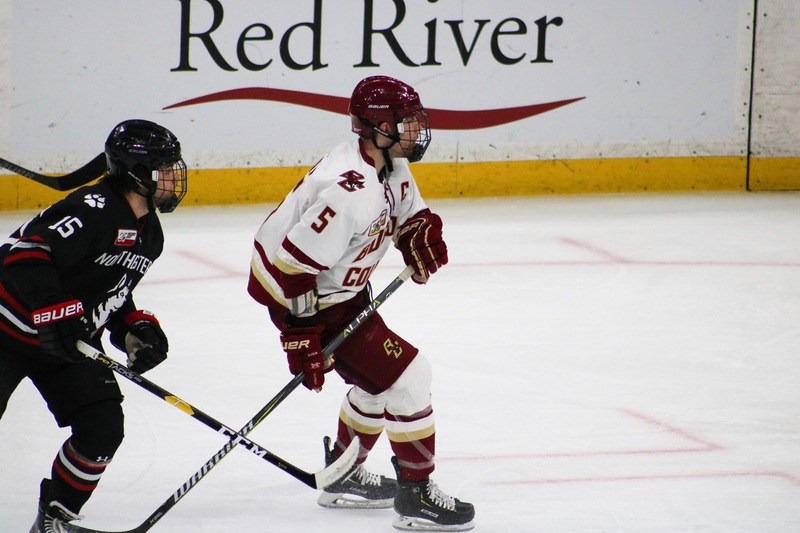 It felt as though the Eagles needed a quick goal to gain some momentum in the third period. That did not happen. 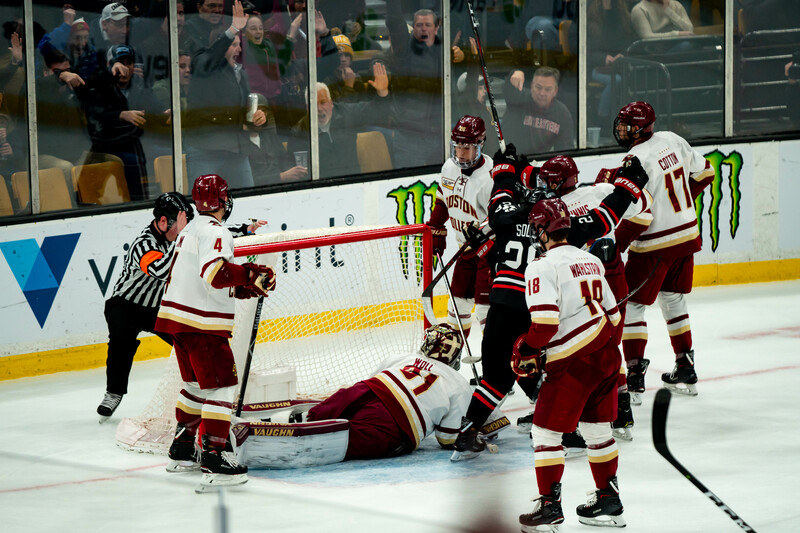 Just over a minute into the third period, Northeastern’s Lincoln Griffin made a nice move in front of the net to get Woll out of position before flipping a backhand into the back of the net. 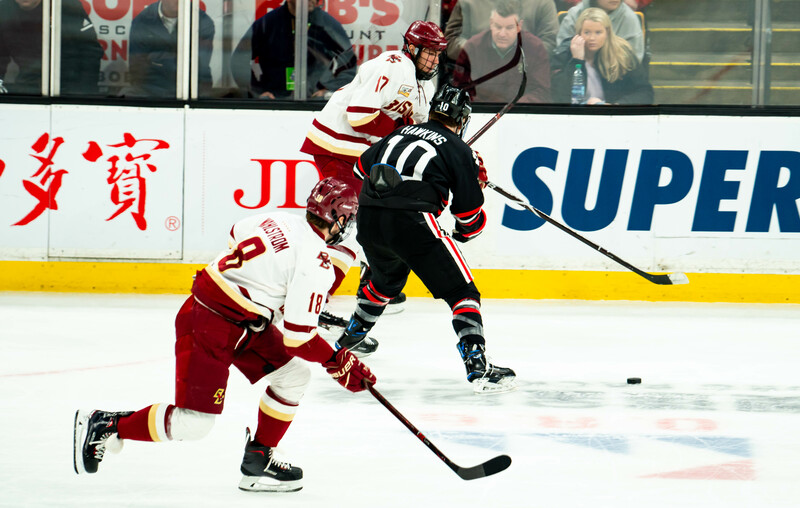 The Huskies quickly took a commanding 3-0 lead to start the third period. 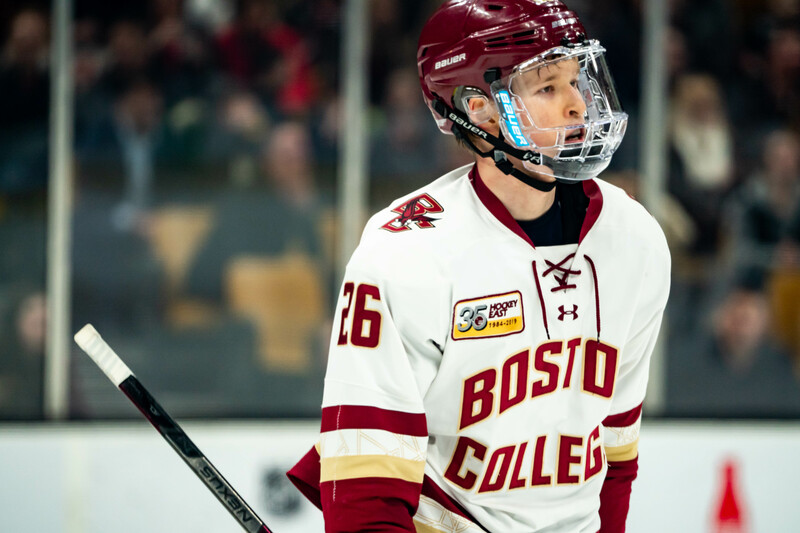 However, David Cotton breathed some life back into the Eagles with a goal off of a smooth assist from Oliver Wahlstrom at 4:09 in the third to make it 3-1. 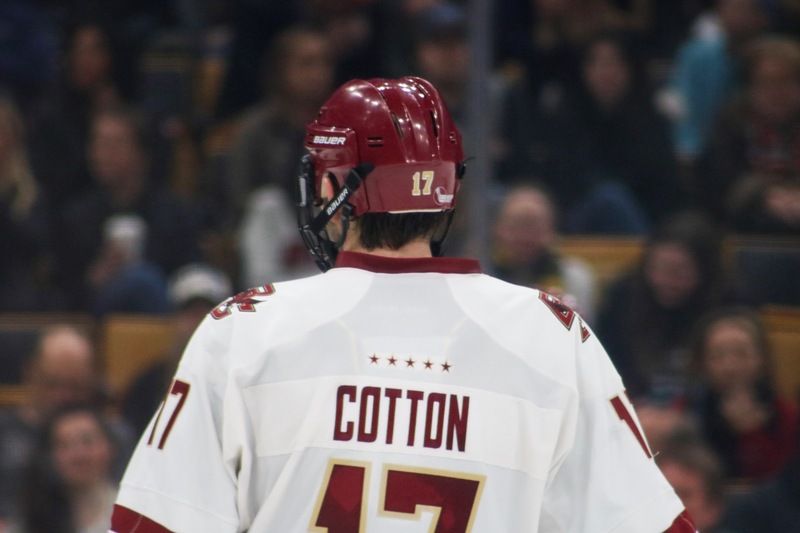 It was Cotton’s 16th goal of the season, nine more than any other Eagles player. 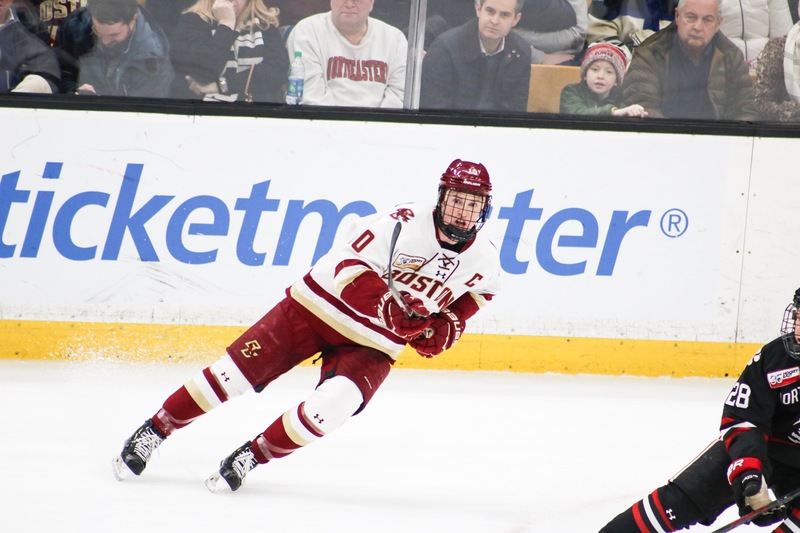 After Griffin’s initial third-period goal, it felt as though the Eagles spent the entire frame in the offensive zone. They peppered Primeau with 15 shots on goal during the period, coming up with some of their best scoring opportunities of the game. 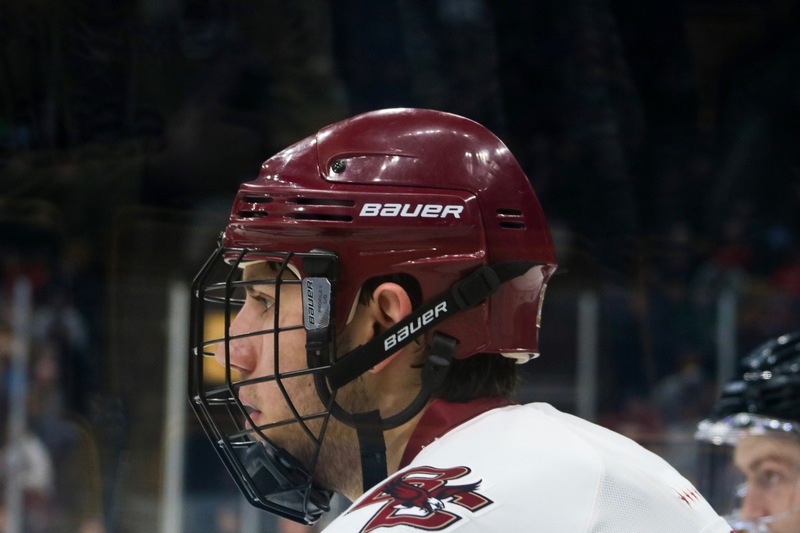 “I thought the last 17, 18 minutres, we played extremely well,” said York of the Eagles’ play in the third period. 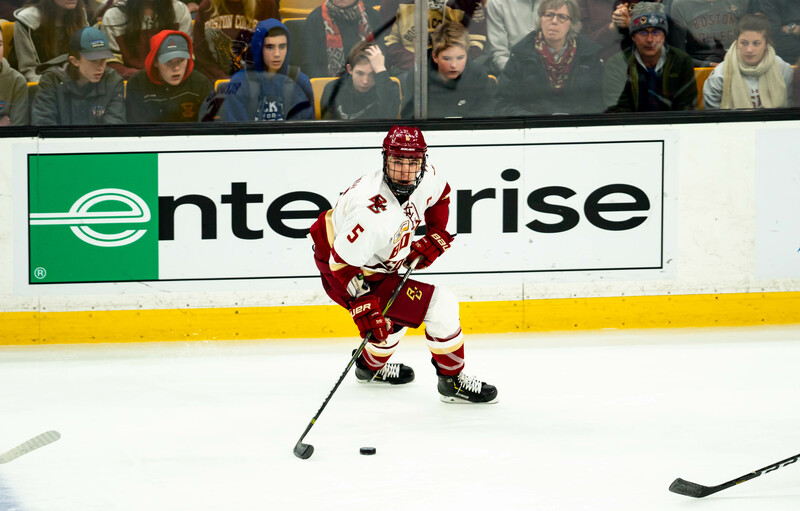 JD Dudek electrified the TD Garden crowd with a goal to bring the Eagles to within just one with 7:46 remaining in the game. His goal set the stage for what was to be an intense final few minutes. The rest of the period was a heart-pounding, suspenseful race to the final horn. 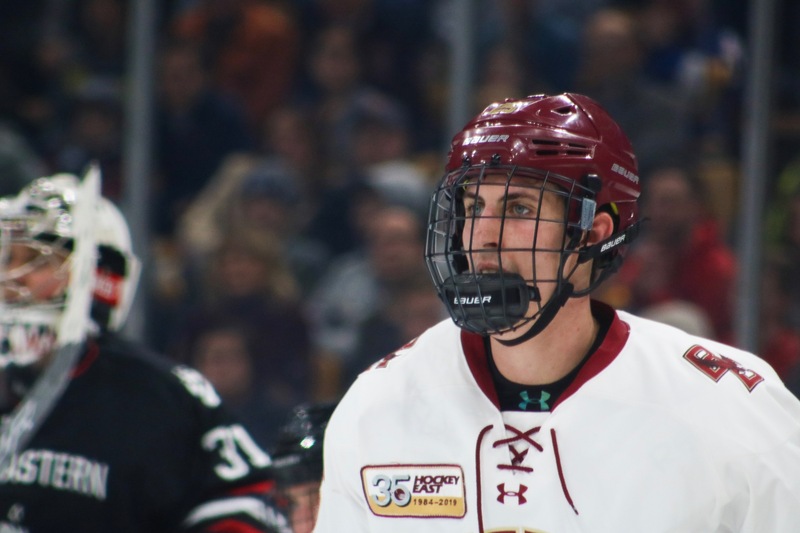 Despite maintaining control of the puck for long stretches, the Eagles were ultimately unable to push one more goal across to complete the three-goal comeback. Cayden Primeau came up big for Northeastern when his team needed him most, earning him both the Beanpot MVP as well as the Eberly Award for the top goaltender of the tournament. Primeau saved 59 of 62 shots over the two games of the tournament. 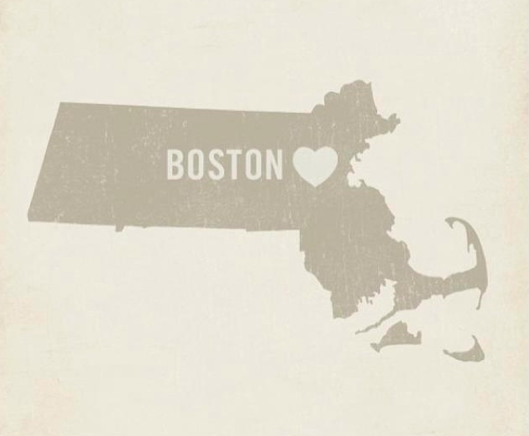 The energy buzzing around TD Garden was palpable and undeniably energetic throughout the whole game. The student sections for both schools showed up in a big way, trash talking with dueling chants all the way through the end of the third period. 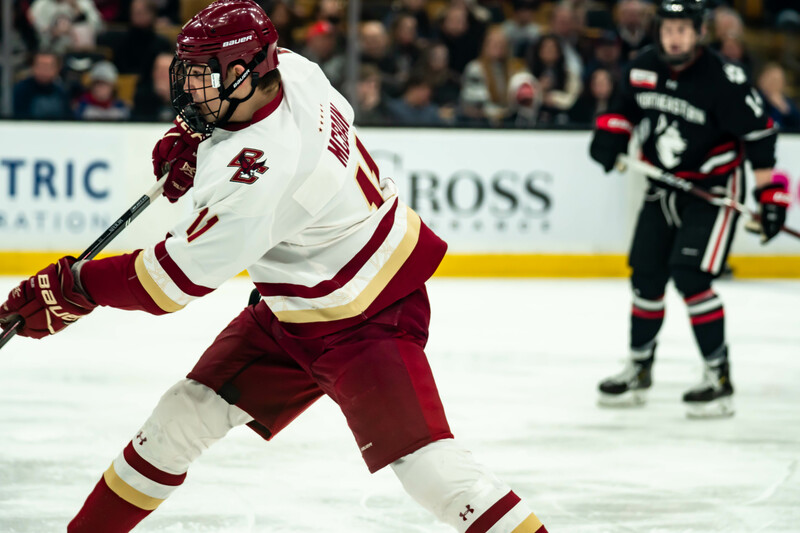 Despite the loss for BC, hockey fans couldn’t have asked for a much more entertaining game than the one they got on Monday night. 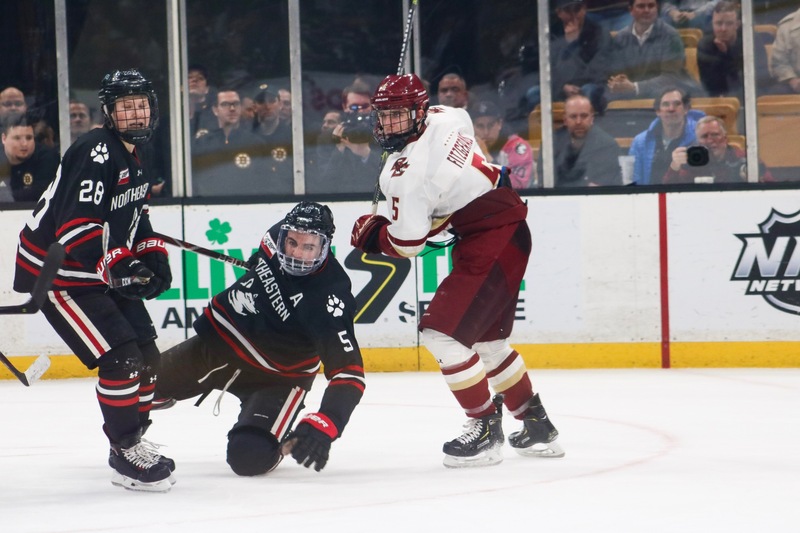 After a clean, fast-paced championship game, however, the Northeastern Huskies emerged victorious and grabbed their sixth Beanpot victory of all time. There was a lot of good things to take away from this game for the Eagles. Although they couldn’t quite come back to beat No. 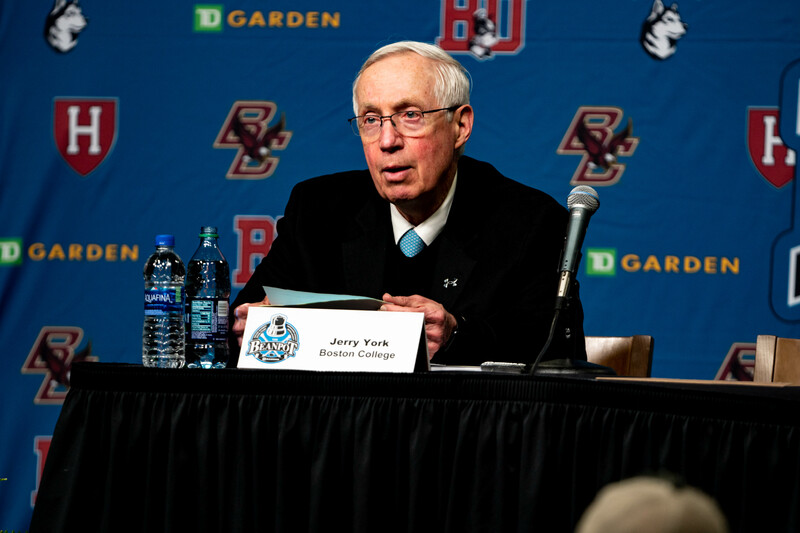 14 Northeastern, Monday night’s performance was a solid one for Jerry York’s squad. They’ll face another tough test in their next matchup, a road game this Friday at No. 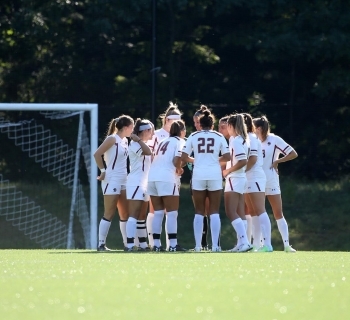 2 UMass Amherst. 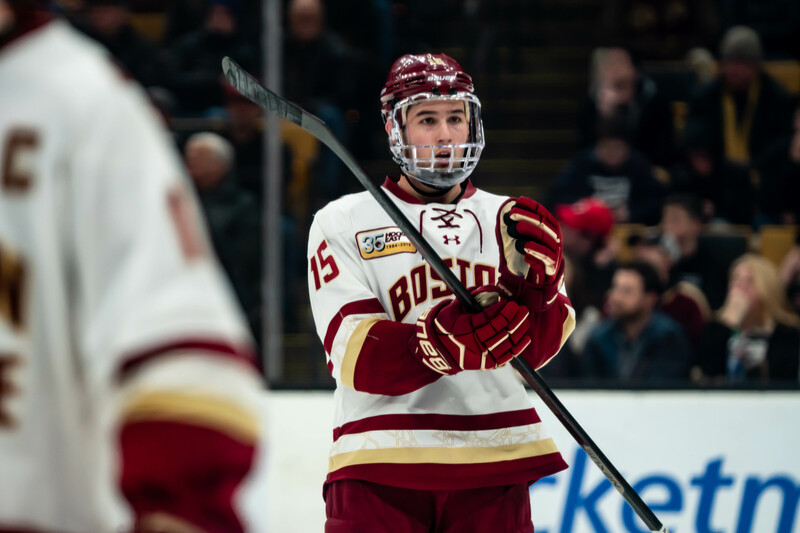 The Eagles will return to Conte Forum for the second game of the weekend series with UMass for a Saturday evening game, scheduled for 8 p.m.